MODONA's 24" Towel Bar will help you transform your bathroom into the bathroom of your dreams. 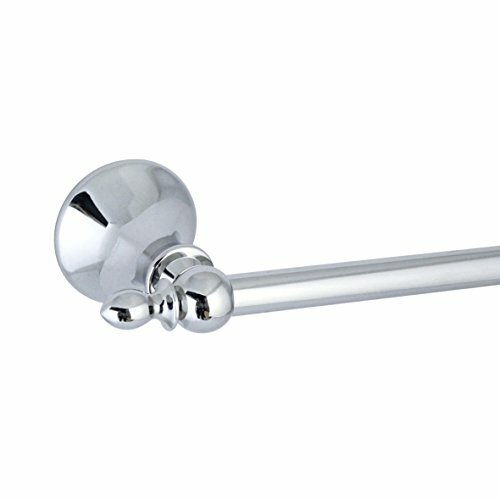 Towel Bar is made of high quality STAINLESS STEEL, NOT Zinc or Aluminum; Stainless Steel Thickness = .8mm (double normal). Please see diagram on left side of this page for EXACT Towel Bar dimensions = 24" Center Base to Center Base and 26½" End to End. Includes heavy duty hardware, including stainless steel screws, high-quality wall anchors, detailed installation instructions, and Installation template. Base and finish match all other units in this series; please search "Antica Series" to see all the other matching items, including: Double Robe Hook, Toilet Paper Holder, Toilet Paper Holder with Lid, Soap Basket, Towel Ring, 24" Double Towel Bar, and 20" Frosted Glass Shelf. This series is available in POLISHED CHROME, SATIN NICKEL, ANTIQUE BRASS, and RUBBED BRONZE. All of Modona products are covered by our COMPREHENSIVE 5 YEAR WARRANTEE. If you have any problem whatsoever, please contact us by clicking on "Modona Bathroom Company" on the top of this page. Please include a description of your problem, a photo (if possible) and your AMAZON ORDER NUMBER. We will respond and address the problem within 24 hours. 24" Towel Bar. Towel Bar is 24" Center Base to Center Base and 26½" End to End. QUALITY: Towel Bar is made of STAINLESS STEEL (.8mm = Double Normal Thickness), NOT Zinc or Aluminum. This will resist dents and bending much better than zinc or aluminum. BEAUTIFUL: Antique, Classic Design. Beautiful Polished Chrome Finish. Also Available in Satin Nickel, Rubbed Bronze, and Antique Brass Finishes. Base and Finish Match all other Items in Antica Series. If you have any questions about this product by MODONA, contact us by completing and submitting the form below. If you are looking for a specif part number, please include it with your message.